What is a V-Line facial shape? The classical description of youthful facial contours is an inverted triangle, with the cheekbones being the widest part of the face tapering to a pointed chin. This relationship can be altered by age, where the soft tissues of the face start to droop and the jaw becomes more square. Young individuals can also get a squared or widened jawline, and this is usually due a bulky (or hypertrophic) masseter muscle. This is one of the muscles that help with chewing and can be felt at the sides of your jaw when you clench your teeth together. Thicker masseter muscles are completely normal and their size varies depending on the individual. The bulkier the masseter, the wider and more angled the sides of your jaw would look. How does Botulinum Toxin narrow the jawline? Botulinum toxin binds to and enters nerve endings. Once inside the nerve cell, it interrupts signals and causes muscle paralysis. When we reduce a muscle's activity, it will reduce in size (atrophy). The body essentially works out that the muscle is not active and therefore does not need to be as large in size. Aside from this main effect of reducing muscle size, it is theorised that when the pull of this muscle is reduced consistently over years, there can be some bony shape change to the jaw bone as well to help maintain the aesthetic outcome. This latter effect can only be achieved with a specific technique that keeps the reduced muscle size in a persistent narrow range through a regimen of top-ups. How is the Lumaesthetic V-Line technique better? From reviewing many scientific papers around the world, there seems to be many techniques of reducing masseter muscles. Therefore, results are mixed in terms of effectiveness and how long results last for. Having analysed the evidence, we have refined our technique to produce reliable size reduction along with long-lasting results (not just a temporary reduction followed by a rebound). Persistently keeping the muscle thinned is key to better long-term results and avoiding a fluctuating facial width. At Lumaesthetic, we always try to practice evidence based aesthetics and can explain the specific reasons behind why we treat an aesthetic problem in a certain way. Our V-Line facial slimming is more intensive than other clinics, but is backed up by evidence to suggest it works better. Wherever you get this procedure done, it would be useful to ask the doctor what is the evidence behind their protocol. It is also far more efficient on funds to maintain a thinned muscle, rather than having to each time thin it down from its original size. How is it done and what are the risks? The procedure involves a few tiny injections into the jaw muscle with a needle as fine as a human hair. This will have its effect on the muscle over the following 3 months. Research suggests that by the 4th month, the masseter muscle starts to rebuild its size again. 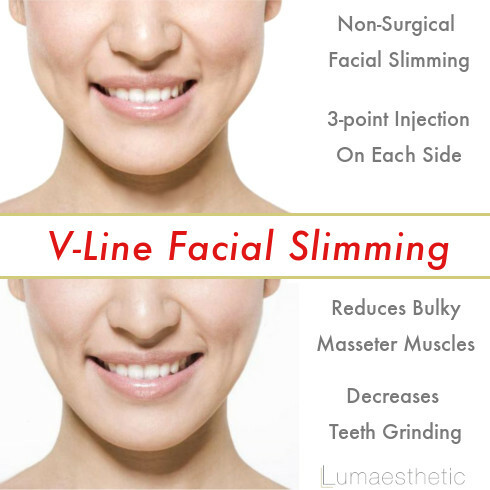 The Lumaesthetic V-Line facial slimming technique involves a high dose initially. We then suggest two further similar injections spaced 4-6 weekly apart. So after a total of three treatments, it will reliably shrink the masseter muscle to a thinner shape (usually averaging a 30% reduction). This may last 6-9 months before you feel the activity in the masseter again, when it will be time for a lower dosage top-up to maintain your aesthetic look. Significant adverse events are uncommon. The most important, but rare complication, to mention is asymmetry from the temporary paralysis of the smiling muscles or weakening of the chewing muscles. Other risks include bruising and hollowing of the cheeks. At Lumaesthetic, we are experienced with our treatments so you will be in the safest hands. What happens after my Botox? 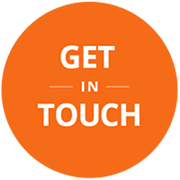 After all treatments with Lumaesthetic Clinics, you will receive an aftercare leaflet, detailing what to expect, things to look out for and how to contact us. We suggest that you do not have large events (e.g. weddings) planned within two weeks of this treatment. After four weeks, you will be invited to come back for a follow-up.